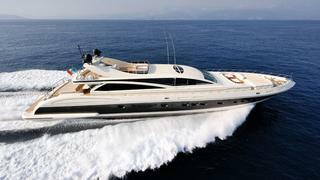 A call to CSO Yachts in France confirms a €900,000 price reduction on the 43m motor yacht Makira. Delivered by Italyachts in 2010 to a design by Andrea Bacigalupo, Makira sleeps up to nine guests in a master suite, VIP stateroom and a double and twin cabin. Triple 24oohp MTU engines give her a cruising speed of 30 knots and a top speed of 35 knots. Fitted with zero speed stabilisers, Makira is available for inspection in Golfe Juan, now asking €14 million.